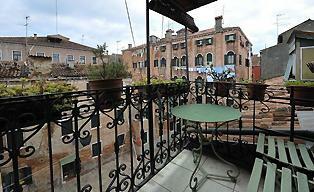 Venice Italy Apartment - Carefully Selected for you! Having your own “Venice Italy apartment” during your stay, instead of a hotel room…? When you open the window above a canal, a taste of fresh Italian blended coffee will come to you. Beneath are gondolas and no tourist yet in sight. Isn't this charming…? You can book a Venice Italy Apartment very easily. It's the same process as if you are booking a hotel room. Apartments with a balcony or a terrace are my favorite. An apartment with a terrace is a unique experience. Watching gondoliers going by on the sparkling canals you feel Venice with intense passion. ...Book a Quality Venice Apartment which you selected? Yes, you can! Have you fantasized to live in an Italian "Palazzi"? Then it's a good choice to rent a quality Venice apartment. Surrounded by comfort in a furnished apartment. Check my page about Quality Apartments in Venice. TIP! Another type of apartments are the Grimaldi Apartments: This company has some apartments available in the CENTER OF VENICE. The apartments are in particular places such as San Marco Square and the Rialto Bridge. You can book for a minimum of 2 or 3 nights. It's great if you can stay here with your family. But, it's also nice too for a romantic couple! But the apartments are hard to book. You must make a reservation early in advanced. Please let me know if you could book this apartment and let me know your experience. And what about the luxurious Canaletto Suites apartment on the San Marco Square. The apartments are carefully selected and with ten beautiful apartments at a unique location in Venice. Prices vary widely. It depends on the availability in your desired period and the number of guest in the apartment. The minimum stay is mostly three days. Usually, there will be a discount with a minimum stay of 7 days. One week is good. Automatically you will live the Italian Venetian life. ...Why on earth should I book a Venice Italy Apartment? 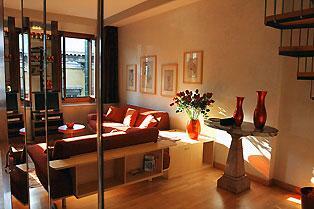 Apartments in Venice are fully furnished, and there are apartments with a lovely canal view. Read my page about a Holiday Home Venice as a location in the most vibrant Venetian districts. With the length of the rental period, a holiday home in Venice is cheaper than a hotel! Ideal with larger groups, families or even couples. It gives you the freedom to cook your own Italian food and feel a local. I'm sure you will feel quickly at home. There’s always a friendly Italian bar around the corner. These are beautiful places where you can enjoy a morning cappuccino and croissant. Another advantage is; when having a Venice holiday apartment, you can prepare your meals. For daily shopping, there are many small grocery shops. I like this very much. Not only it is cheaper than having drinks and snacks outdoors but is nice to meet the locals. Especially, for families with young children, an apartment rental is excellent. You can let your children eat a home cooked dinner. Of course with real local Italian ingredients. Mmm... Delicious! ...What kind of stuff can I use in the Apartment? Generally, when you arrive, there will be enough clean towels and sheets. Precisely to your needs. Italian is very keen on this. Most apartments have air conditioning, and all have heating. The apartments are clean, and this is also how they should be left behind. It depends on your booking if the cleaning has to be done by yourself. 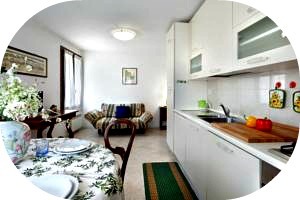 On this review page, you will find reviews on apartments in Venice Italy. And you can also tell me your own experience! In Venice, there are a lot of hotels or apartments for rent. This massive real estate hotel opportunity is due to the separation of Venetian youth. They can no longer pay a house in Venice and leave elsewhere cheaper. Have A Great Story About Venice Italy Apartments? Share it! Write about it here! Display your own story about your Apartment. Writing skills? Your comment will appear on a new webpage. Make it as long as you want with photo's and your story. You have read about how I experienced a Venice apartment. There is enough to choose from, as you can see. Please click on the links to explore my site more.